Fish are the oldest of the vertebrate groups and have the greatest number of species at around 33,100 currently identified. They live almost anywhere there is enough water, from the highest mountain streams right down to the deepest ocean abyss. Almost all are cold blooded, able to turn the coldest most uninviting waters into areas of high productivity. 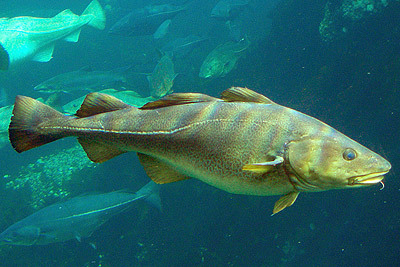 Atlantic Cod, Gadus morhua - Gadiformes. An important food fish for over 1000 years, cod have been overfished and the previous enormous stocks have collapsed, recently cod farming has been successful. 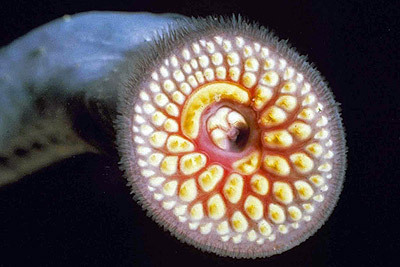 A jawless fish, lampreys are parasitic on larger fish, they attach themselves to their host and rasp at tissue with the teeth and/or feed on blood, letting go when they have had enough. 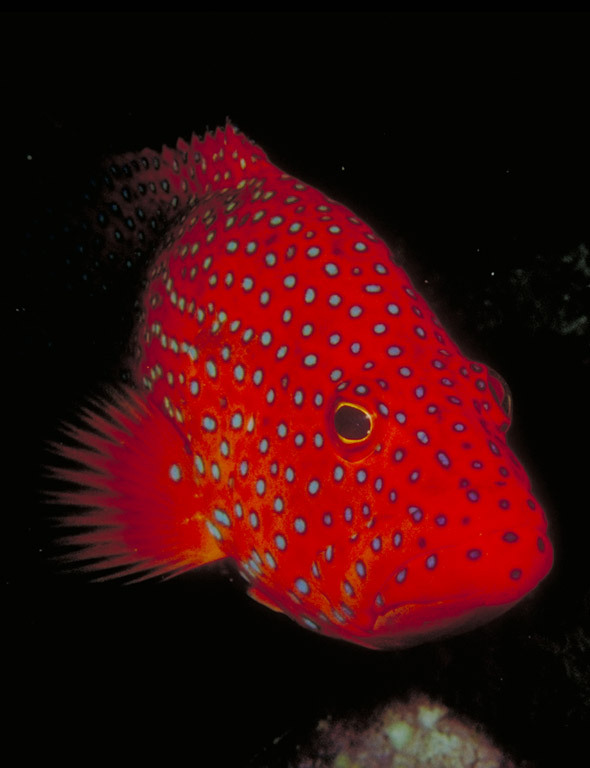 A reef fish with poisonous spines, predatory on small fish and invertebrates, can often be seen at night near to lights by the sea that draw its prey. If diving or snorkeling towards dusk they can emerge in surprising numbers from nooks and crevices, sometimes rather shockingly appearing if flushed out by another fish diving for cover with its spines erect as defence. A Parrotfish, the group is considered to be a subfamily of the Wrasses. These fish have a particular arrangement of their teeth that looks like a parrots beak. They feed on algae that grows on coral and when diving or snorkeling can be heard grinding and rasping away at the coral underwater. The coral passes through them and is deposited as coral sand which helps build reefs and islands over time. 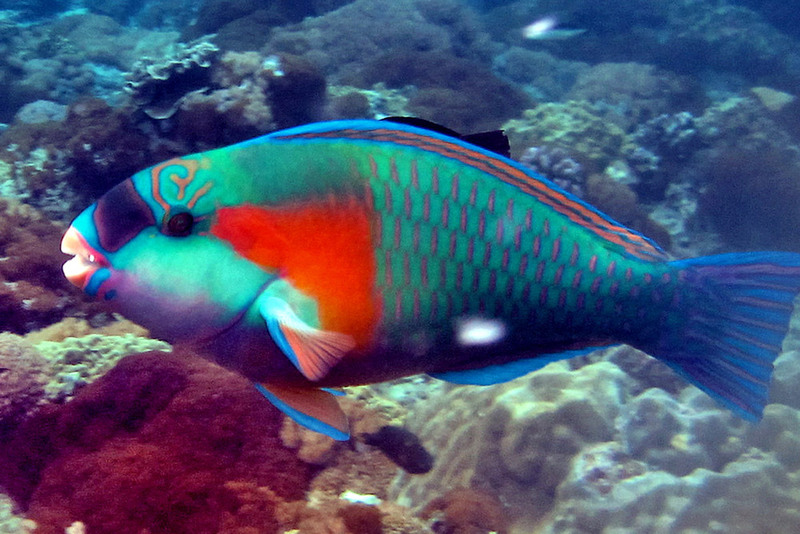 Most parrotfish start off life as females, and then become male later in life. A Hammerhead Shark - Elasmobranchii - a cartilaginous fish. One of the defining characters can be seen clearly, the heterocercal (asymmetrical) tail. 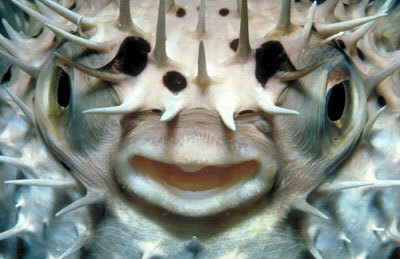 A puffer fish or blowfish - Tetraodontiformes - amongst many other names. 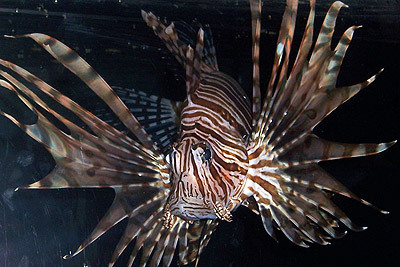 When threatened, these fish are able to take in a large volume of water (not air) to blow themselves up to nearly spherical at which point the spines point outwards. These fish are also amongst the most poisonous vertebrates in the world having enough tetrodotoxin to kill a human. They are highly prized to eat known as Fugu, chefs who prepare them are controlled by law in Japan and several other countries where they are eaten. A file fish - Tetraodontiformes - Found usually in shallow water of 30m or less and frequently in or around coral reefs. Not great distance swimmers but very maneuverable as the pair I watched shredding a large jellyfish while snorkeling in the Red Sea demonstrated. A Manta Ray, Manta Birostris - Elasmobranchii. 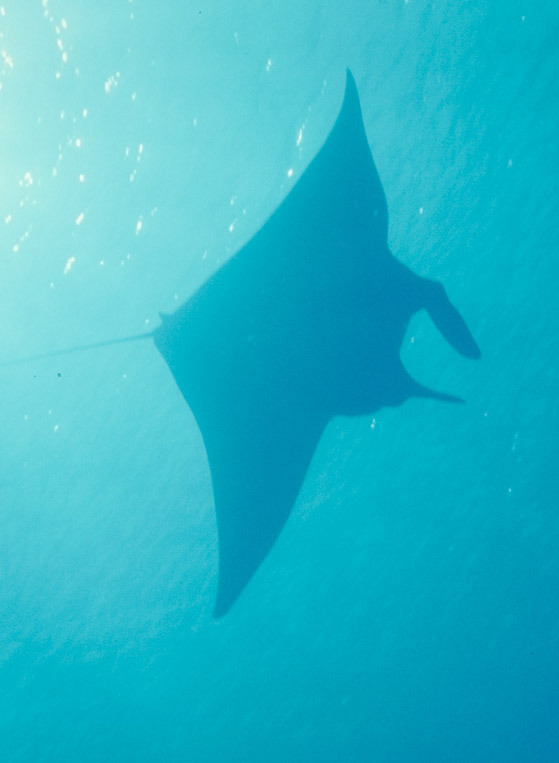 The largest of the rays, mantas can be over 6m (20 feet) across and weigh more than a tonne. They are plankton feeders, gentle and harmless despite their appearance and alternative name of devilfish. The status of fish groups, whether they are Classes, Orders, infraorders, subclasses etc. is something that is currently changing and somewhat confusing as to what they should be called. I have named some of the major groups without saying which level the group is (class, order, etc.) as doubtless the hierarchy will change whereas the names are relatively constant. The following list is representative but not complete. Chondrichthyes - cartilaginous fish, skeleton made of cartilage rather than bone, gill slits at the side of the head, urea retained in the blood for osmotic balance. Sharks - mainly carnivorous on other fish, often have several series of teeth that move forwards to take the place of damaged or missing ones. Plankton feeders - Plankton are tiny often microscopic, plants and animals of many different groups that live in the upper levels of waters, particularly seas. They are the basis of many marine food chains and many fish are specialized to sieve them out of the water. Such fish include anchovies, mackerel, sardines and the largest of all fish, the whale shark (a shark but not a whale). Many other fish feed on plankton when they are in the larval stage and many kinds of fish make up part of the plankton themselves while they are larvae. Detritus and algae in mud and sand - fish such as mullet feed in this way, they have highly adapted digestive systems to separate out the organic food matter from the sediments. Anything that fits in their mouth and is edible - some fish are not at all fussy about what they eat and end up being pretty successful as a result. Cod in particular fit into this category, they will eat detritus, shrimps, worms and other invertebrates, smaller fish and even birds if they are big enough and get the chance. Fish that do this tend to be demersal - feeding at the bottom the water. Ambush predators - These fish feed on other fish or crustaceans such as shrimps, crabs, worms etc. They may lie on the bottom of the water as do flatfish such as flounders, sole, turbot and halibut. These fish are highly unusual in that they are asymmetrical with both eyes on the same side of the face and a twist to the mouth. The Anglerfish take ambush to another level by having a lure that has evolved from the first three spines of the anterior dorsal fin. They may lie in wait camouflaged against the sea bottom, or may float in the water column in the dark depths with a bioluminescent lure that attracts smaller fish or invertebrates that see it as prey, in the last instant the anglerfish opens its usually enormous mouth and swallows the would-be predator. Shell crushers - many rays and skates have their teeth adapted to crush shelled organisms such as snails, oysters, mussels, clams, shrimps and crabs. Cleaning stations - Some small reef fish, particularly wrasses and gobies make their living by cleaning larger fish or turtles. 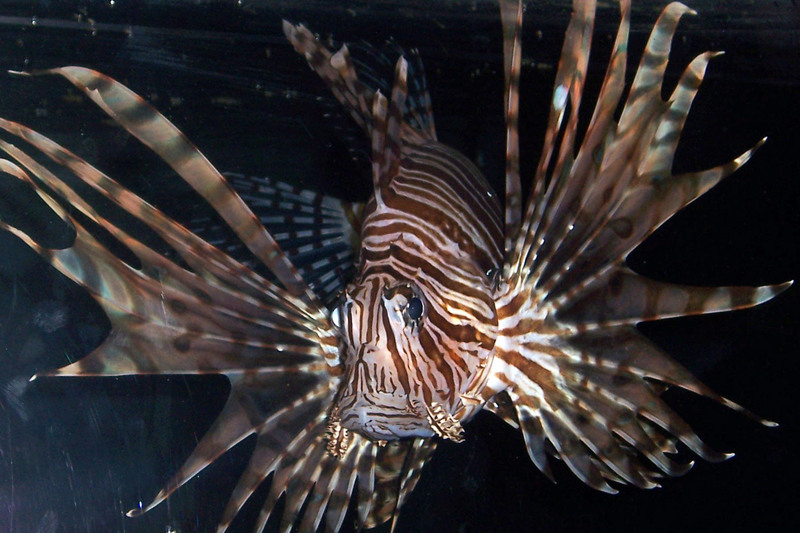 The larger fish come to the site of the cleaning station and often a number of the cleaners will remove parasites from the skin and even inside the mouth and the gills of the fish which refrain from making a meal of the cleaner fish which they might do in the normal course of things. Fish are an important part of many food chains and webs. Many terrestrial or partly terrestrial animals such as birds, bears, reptiles etc. also feed on fish so their food webs stretch beyond the water. The biggest natural consumers of fish are other fish. 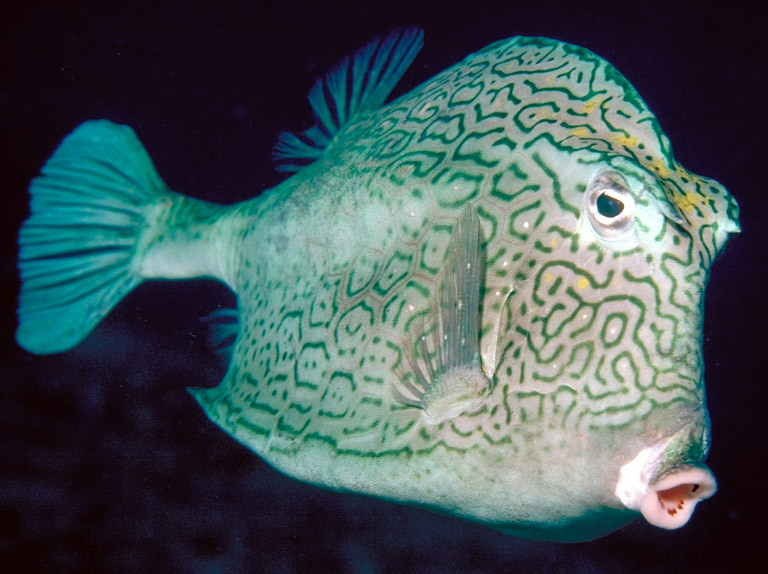 Most fish are not cared for by the parents, the eggs are fertilized externally and often left to drift in the water, particularly at sea, though may stick to rocks where in some cases the parents may waft water over them to ensure they survive and hatch. After hatching the care of even this small number of fish mainly stops and the young larval fish are on their own. As fish start off so small, in large quantities (Atlantic cod lay around 5 million eggs in a single spawning for example) and are on their own, this means that they are eaten by all manner of other fish and invertebrates of all sizes with a huge mortality in the early larval stages particularly when they are part of the plankton. Fish are a major source of protein for people too, wherever there is a body of water near where people live it will be fished for food (or was in the historical past). The total world fisheries for human food, marine and freshwater is around 80 million tonnes per year! With another 13 million tonnes of invertebrate fishery, shrimps, squid, mussels etc. Pelagic - fish that live in the water column or near the surface, free swimming. Demersal - fish that live on or near the bottom of the water including coral reefs. Tuna are amongst the most remarkable of fish, their adaptations are predominantly directed to swimming quickly. They can swim for sustained periods of 2-12 kmh (walking to jogging pace, but in water) and reach burst speeds of up to 70 kmh. Tagging studies have shown migrations of over 10,000km. They have a shape that is optimized to slip through the water. The tail or caudal fin is held away from the body on a narrow region called the caudal peduncle (I've always liked that name). The separation of the tail fin from the body in this way aids streamlining as the tail effectively acts as if was hydrodynamically separate to the rest of the fish. One of their most remarkable adaptations to swimming is that they are partially warm-blooded. Fish are generally ectothermic, they are the same temperature as the environment and unable to thermoregulate (maintain a steady temperature different to the environment). Tuna such as the Atlantic Bluefin are able to maintain a temperature of 24-35C in their swimming muscles even in water temperature down to 6C. Higher temperatures allow the biochemical reactions required to proceed more rapidly. This temperature however is not closely regulated as in endotherms such as mammals and birds and varies quite considerably. It is the deep red muscle that is kept at a higher temperature, this runs the length of the fish from the pectoral fin to the tail and forms about 10% of the cross-sectional area of the fish. There are collections of blood vessels called rete mirabile (Latin for "wonderful net") that have the task of exchanging heat from warmed blood flowing away from the muscle to colder blood flowing towards the muscle. Thus the active muscle can be warmed up quickly and kept warm without needing to heat up the whole body. This system also has the advantage that heat can readily be lost by adjusting the constriction of arteries and veins to dump heat around the rest of the body if it builds up too much. There are a number of tuna species of various sizes, though they tend to be quite large fish. Commonly they are from 40-200cm long at maturity with the largest being 300cm long and weighing upwards of 650kg. 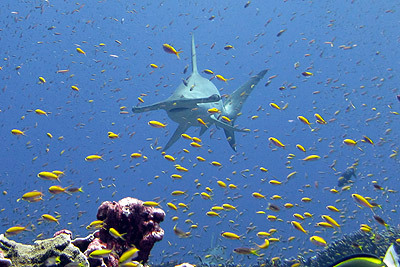 Top banner picture, Reef shark stalking a school of jack fish at Sipadan Island, Malaysia, picture courtesy Avoini, used under Creative Commons Attribution-Share Alike 3.0 Unported license.